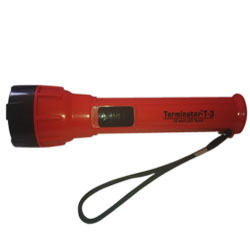 - Terminator T-2 Heavy Duty 3AA Cell LED Handy Torch (Not included). - High range pointed beam and focus. We have a wide assortment of battery torches which has become a necessity for everyone due to immense power shortage. These torches are specifically designed as per the customer requirements and are available in different eye catching design, sizes and delightful colors. It has got rotary flashlight head so as to adjust the focus to best one. We feel proud to offer our customer best and excellent quality array of Battery Powered Torches. 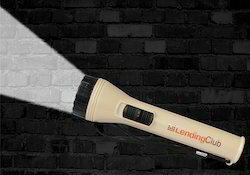 The offered torch is manufactured by our professionals with the use of best quality basic materials and skills. They are cost effective and very modern in approach. We “Galaxy Electronics are a well-known manufacturer and trader of a wide array of Battery Torch. Battery operated portable unit, with a powerful beam throw of upto 150 meters and with very high visibility. Runs for 11 hours when fully charged. The battery can be charged both by AC adaptor or Solar Panel.